Hello James Franco! I see you’re back for a second appearance on CGB (see my review for The Interview). This is my review of Oz the Great and Powerful! 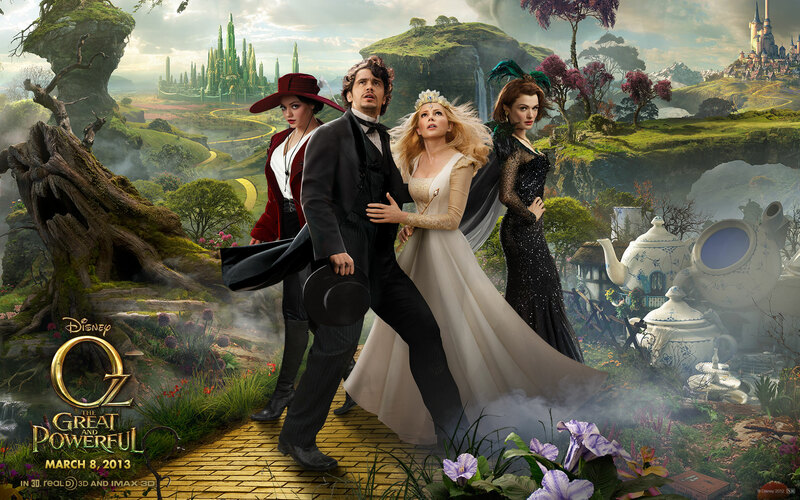 Oz the Great and Powerful is a prequel to the classic Wizard of Oz. It tells the story of a shady, self-serving con artist named Oscar Diggs who ends up in a magical land and is mistaken to be the prophesized wizard who will save everyone from the Wicked Witch. I grew up reading classic fairy tales as a kid and I’m a fan of the live-action fairy tale genre. I adore last year’s Maleficent and Cinderella is on my list of best 2015 movies. I even enjoyed the admittedly-flawed Into the Woods from last year. As a fan of the genre, Oz the Great and Powerful is a disappointing watch. James Franco is not the problem here or in The Interview. In fact, he’s a pretty good actor. He does a decent job portraying a selfish, superficial man with guile and hidden agendas. I also like that he starts out oblivious to how his self-absorption hurts others and how he slowly changes his ways once he realizes the consequences of his lies and half-heartedness. That’s a good message for kids (this is a kids movies, after all). It’s also good for kids to see that you don’t have to be a perfect person to do great things. The only developed character is James Franco’s Oz, so his performance alone is what kept me watching. I don’t have a lot to say about Mila Kunas, Rachel Weisz and Michelle Williams, but I will give them credit for doing what they could with their roles. Even though I think Mila Kunas is better in films that take place in modern-day settings than in period pieces or fairy tales, but she is actually believable as the naïve, hot-headed Theodora. Making this a chosen-one story was a big mistake. Any time a character is predestined to go on a quest, all the authenticity and character agency is lost. No matter how hesitant the character is, you know that he/she is gonna end up choosing to go along with the prophesy anyway, so their choice to do so comes off as a demand of the script. Because Oz is the important person who is prophesized to save the land, none of the friendships he has with the side character feel genuine. It has the vibe of “we’re your allies because you’re the destined one” and not “we’re your allies because we sincerely care about you as a person.” Personally I find it more compelling when characters choose to go through Hell and back for each other even if they have nothing to gain from being with one another. In addition, the relationships are never fully developed enough to be considered authentic because the script is a by-the-numbers checklist of prophesy clichés. Also this should’ve been an animated film. The environments would have looked much better than they do here. There’s one sequence where the camera zooms in on a swarm of butterflies and it looks weirdly pixelated. This only bugs me because none of the other effects are pixelated. The CGI looks gorgeous when the camera is still, but a pan-across shot shows how incredibly fake the CGI is. Overall Oz the Great and Powerful made me sad. The actors all do a capable job and the colors are stunning, but there’s nothing enchanting about contrived relationships and predictable story formulas.